Ice cream on a stick is one of the varieties of ice cream novelties. 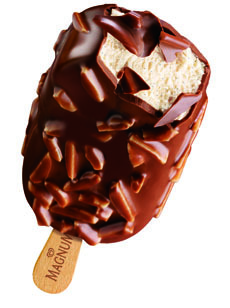 Above, a vanilla ice cream bar topped with almonds from Magnum, our favorite gourmet ice cream novelty. This is Page 8 of an eight-page article on the history of ice cream. Click on the black links below to visit other pages. During the 1950s, supermarkets emerged with big freezer cases they wanted to fill with ice cream. It was during this time that usage of lesser-quality ingredients increased: many producers were using artificial flavorings, fillers, very low percentages of butterfat and pumping large quantities of air (sometimes 100% overrun) into the ice cream to fill out the carton so that supermarkets could sell bulk gallons for $1.99. It was cheap, convenient and ubiquitous, but not necessarily good. In 1958, Reuben Mattus of The Bronx, whose family had produced ice cream in The Bronx since the 1920s, saw an opportunity to create a “gourmet” ice cream using fine, all-natural ingredients, 12% butterfat instead of the standard 10%, and a 40% overrun. At the suggestion of his wife, he created a meaningless name that sounded Danish—Häagen-Dazs—and sold it for 75 cents a pint in New York City gourmet shops, about three times the price of supermarket pints. The initial three flavors, chocolate, vanilla, and coffee, were an instant hit. 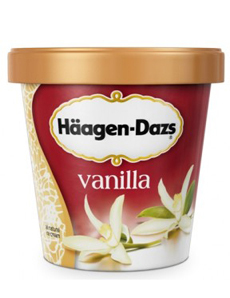 Häagen-Dazs, the brand that began the superpremium ice cream movement. The original design had no photo, just the gold pattern now on the side. Photo courtesy Häagen-Dazs. With the postwar boom, a freezer in every home, and freezer cases in every grocery store, it was easy to enjoy ice cream at home: traditional ice cream parlors and soda fountains began to disappear. The 1970s saw a return to quality via the emergence of “premium” boutique brands like Häagen-Dazs, with high butterfat content and low overrun. Thanks to the new electric home ice cream machines—no more hand cranking—more people became interested in making ice cream. In 1976 the first scoop shop opened and in 1977 Ben and Jerry opened their own shop in Burlington, Vermont, making flavors no one had seen before: Chocolate Chip Cookie Dough, Cherry Garcia, New York Super Fudge Chunk. With today’s fusion cuisines introducing chipotle fudge chip ice cream and lime wasabi sorbet (both delicious), the number of flavors is endless; estimates of 1,000 flavors are inadequate when local boutique companies that specialize in novelty flavors list 100 rotating choices on their rosters. But most of the ice cream sold in America is still vanilla, followed by chocolate. The numbers are based on sales of supermarket half-gallons, not on superpremium pints, which represent just 3.5% of sales (premium brand half-gallons are 51.5%, and regular half-gallons are 45% [source IRI]). 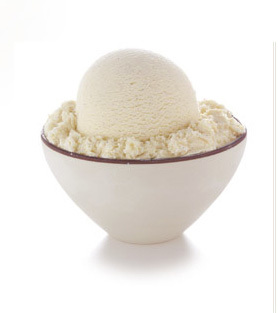 Photo: Häagen-Dazs Vanilla Bean ice cream.